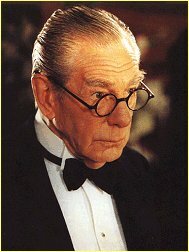 Modern audiences knew Michael Gough as Alfred the wise butler in the Batman films of the 1980s and '90s. He was a successful actor decades before that, however, primarily known for numerous fondly-remembered horror films. Gough was Holmwood in perhaps the finest film adaptation of Dracula, 1958's Horror of Dracula. He also played the murderous crime reporter in Horrors of the Black Museum, the mad scientist in Konga, the deranged zookeeper in Black Zoo, the practical joking artist in Dr Terror's House of Horrors, the master of the moon in They Came from Beyond Space, the horsewhipping father in Crucible of Horror, and the voice of common sense ("Kill the monster!") in Joan Crawford's disastrous last film Trog. In his best film, he had a supporting but crucial role as the mill owner in the low-key science fiction classic The Man in the White Suit with Alec Guinness. He also had a long-running connection to Doctor Who, with goofy guest appearances in 1966 and 1983. His then-wife, Anneke Wills, played the Doctor's companion Polly in numerous mid-1960s episodes with Patrick Troughton. In a bit of an odd coincidence, Gough was friends for decades with Alan Napier, the British actor who played Alfred in the 1970s TV series of Batman. They often worked together on the British stage, and both appeared in the ancient epic mini-series QB VII. Late in his career, Gough worked in two of Tim Burton's films, Sleepy Hollow and Corpse Bride, as Burton's homage to Gough's early work.